BioAir system helps enhance residential quality of life by eliminating nearby brewery’s H2S odors. Tooheys is one of Australia’s oldest brands of beer, continually brewed since brothers John and James Toohey began making it in 1869. Today, the beer is brewed across the country in eight breweries owned by the Lion Company. One of those breweries is located in Lidcombe, New South Wales, just a few miles from downtown Sydney near the Parramatta River and the city’s Olympic Park. The brewery, first built in 1955, is now Australia’s largest. The site sits within an industrial park, but it’s bordered to the east by a large residential neighborhood. 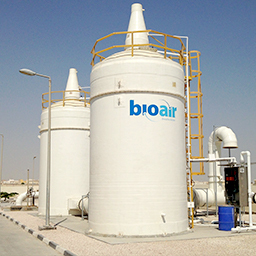 In 2014, BioAir Solutions was dispatched to upgrade the site’s odor control system to ensure the site remained in the good graces of its neighbors. Hydrogen sulfide (H2S) was the primary offending odor produced at Tooheys. The compound typically forms when organic materials degrade in anaerobic conditions. Because breweries use lots of water and lots of organic inputs, the risk that H2S odors will form during wastewater treatment is high. Food and beverage facilities of all types and sizes usually face similar challenges. During the search for an odor control solution, the Lion Company noted their commitment to environmental stewardship: They would not install any system that required the use of dangerous chemicals. Together with our local partner Aquatec, we specified a “green” odor control solution for the site. EcoPure® dual-tech treatment – This treatment system starts with BioAir’s revolutionary biotrickling filter. Featuring our patented EcoBase® structured synthetic media, the biotrickling filtration stage provides superior performance and control over key parameters like moisture content, pH and nutrient supply. Then, secondary polishing is carried out by an activated carbon filtration stage. One EcoPure system was installed in the brewery’s wastewater pre-aeration basin and designed to handle 2,500 cubic meters per hour (1,471 cubic feet per minute). A smaller EcoPure system was installed in the brewery’s anaerobic reactor headspace to treat 200 cubic meters per hour (118 cubic feet per minute). EcoCarb® activated carbon filtration – EcoCarb is based on the established odor control method of trapping offending compounds within carbon beds and releasing clean air. Two EcoCarb units were installed to handle air emissions from the buffer tank and dewatering building of the brewery’s wastewater treatment plant. Installation of the filters was completed in August 2014, and the results were immediate. Data collected during routine post-startup testing showed that the EcoPure and EcoCarb filters had begun removing 99.9% of the H2S compounds as well as the majority of other organic compounds detected in the airstreams of the brewery’s wastewater treatment facility. The success of our installation at Tooheys brings to mind two important and recurring themes. First, urban sprawl has led to the settlement by residents and businesses in spaces nearer and nearer industrial facilities. Once-isolated facilities have become sensitive sites where odors must be controlled to a much greater degree. Tooheys is proof: The neighborhood that surrounds it is a lot different now compared to over 60 years ago. Second, it shows once again that our “green” odor and emission control solutions can keep odors under control without the high cost and added danger associated with chemicals. If you’re facing an odor challenge at a food and beverage facility —or any industrial site— consider an on-site evaluation from BioAir Solutions. Our technicians will examine your facility and its processes, assess odors and emissions and then design a custom solution that meets your specific needs. You can also download our guide to industrial odor control to learn about the odor control process in greater detail.